The judge running Northern Ireland's only substance misuse court has insisted it is not a soft option. District Judge Fiona Bagnall said the new approach, being piloted at Laganside in Belfast, holds offenders to account and challenges them to tackle their addictions. Judge Bagnall said: "It's certainly not a soft option. "People are being held accountable for their behaviour and they're responsible for what they have done. "In no way do you find that this is something they can do lightly and get away with. "It's definitely a tough option for them to pursue." she added. Fifty men and women are being processed through the system on a range of charges including assault, theft and motoring offences. They include homeless people, university students and those in full employment. They are addicted to a range of substances including heroin, crack cocaine, prescription drugs, cannabis and alcohol. Under the new scheme sentencing is deferred until they complete the intensive programme of treatment. Participants must also agree to regular drug and alcohol testing. Judge Bagnall added: "Once they have pleaded guilty they are put on to this programme for trying to address their addiction problems. "They have to address all of the issues; not only the substance that they are taking but also the problems they are facing; the chaotic lives they have. "We are trying to stabilise them so that they can come off their drugs or alcohol." The substance misuse court is one of five dedicated problem solving courts being trialled by the Department of Justice and is being delivered by the Probation Board in partnership with Addiction NI. According to the Probation Board, more than three quarters (76%) of people under their supervision have an alcohol or drug offending related problem. 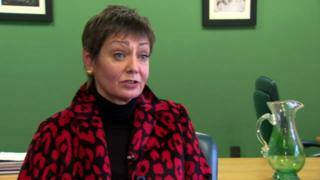 Dr Geraldine O'Hare, director of rehabilitation at the Probation Board, said: "I know that for people out there who have been victims and communities that have been harmed this may not be an easy conversation to hear. "But it is the right thing to do because if we are to tackle alcohol and drug-related crime in Northern Ireland, we must work with the perpetrator." The substance misuse pilot is due to finish at the end of March. Any decision on its future will depend on re-offending rates. Solicitor Pearse McDermott said: "It's certainly a very different system to that which we are used to. "But, whilst it's very informal and very touchy-feely, effectively it does seem to be working, in that those people participating in the course do not seem to be getting involved in further offending."